In addition to the Monks of New Skete, I turned to Cesar Millan, aka "The Dog Whisperer" to help us get ready for the arrival of Miles. Although I know Millan is like a household name for dog owners, and his methods can be controversial, I had no previous exposure to his work. 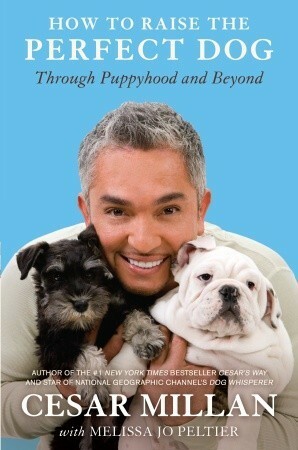 While much of the material was similar in the two books, I think I preferred The Art of Raising a Puppy. 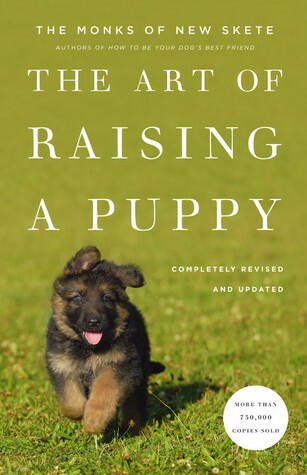 However, How to Raise the Perfect Dog is a great story for someone who wants to read an opinionated, informed memoir about raising four puppies written by someone with a lot of experience. For the purposes of the story, Millan takes on four new puppies of different breeds and backgrounds (schnauzer, pit bull, lab, and bulldog), and writes about how to raise a puppy. The book is more memoir and less instruction manual. But it's a good introduction for a first-time dog owner (except that I'm doing everything wrong and our house is totally set up wrong for a new puppy because it's so open). It has also made me want to start watching his tv show for practical pointers. It sounds like Supernanny for dogs, and I need all the help I can get. I've been feeling the fog of having two toddlers beginning to lift for a month or two (maybe I'm deluding myself). They seem to be on the counters less often. It's been at least a few months since the last paint mishap. Eli isn't making a break for the road twenty times a day. They're both (mostly) potty trained, and we can sometimes get a night or two of sleep a week when no one wants to share our bed with us. But I am a masochist, so when the kids started up a puppy campaign about three weeks ago, I didn't say no. I'm allergic to dogs, so they researched the "hypoallergenic" breeds. We visited a friend's goldendoodle puppy and I wasn't wheezing after twenty minutes, so we called up the breeder and there were still seven puppies from the litter available for adoption. 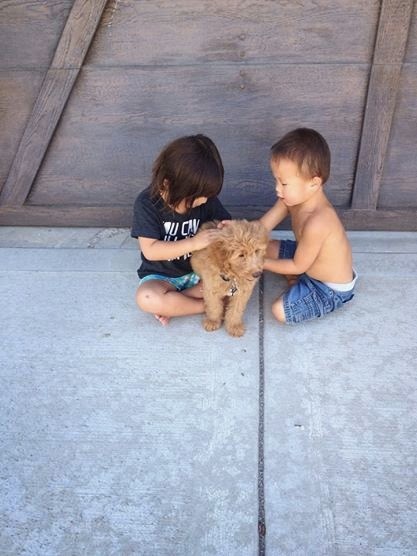 Miles has now been a part of our family for a little more than two weeks. We had four days from the time we decided to add him to the family until we picked him up. I have literally ZERO experience with dogs. I hate dogs. I'm afraid of them. In fact, I like to say that my fears while running by myself in the dark are: 1) dogs, 2) skunks, 3) cars, 4) rapists. I certainly never thought I'd cuddle with one or bathe one or clean up poop from one or pull one voluntarily onto my lap. Long story short: we needed help. And quick. I have a friend from high school who has a mature goldendoodle, and I asked her for advice, and she said that the best books I could read were by the Monks of New Skete, who breed and raise German Shepherds in Upstate New York. I knew nothing about dog psychology and still know very little, but this book was an excellent crash course. The Monks go into detail about how to become the leader of the dogs' pack, how to understand them, and how to be a gentle but firm "master" to them. Furthermore, I loved the insight I got into both breeding and raising puppies and into the contemplative live at New Skete. But only a glimpse, because any opportunity for a contemplative life for me has now been put off a little bit while I help raise this sweet puppy of ours. My only critique of the book is that it reads so much like a novel that I wanted to read it from cover to cover before we got the puppy, and now that he's here I don't have the time to go back to it like I should. Daniel and the lions' den. Noah's ark. Shadrach, Meshach and Abednego and the fiery furnace. Nephi and the broken bow. What do these stories (and hundreds more like them) have in common? Well, for one thing, they all feature men who are faced with a moral dilemma. Children in Primary and Sunday School classes learn to emulate them. But as the mother of three young daughters, I often wish we knew the stories of women in the scriptures as well as we do the stories of their male counterparts. Girls Who Choose God, a new picture book written by McArthur Krishna and Bethany Brady Spalding, illustrated by Kathleen Peterson, and published by Deseret Book, goes a long way to filling the gap. The picture book, which features a dozen women from the Bible, including Eve, Mary the mother of Jesus, Mary Magdalene, the prophet Deborah, and other, lesser-known women, follows a particularly effective format. On the first page spread, each woman's story is introduced, including the moral dilemma she faces. For example, we learn that "Esther had a choice to make. She could keep her luxurious like as the queen, or she could try to save her people by telling the king she was also a Jew." On the second page spread, Krishna and Spalding recount the choices the women make, then they ask readers to apply the story to their own lives. The Esther story concludes with the question, "When have you made a choice to stand up for others?" This allows readers to see that each woman faced a choice, and that it's possible to make courages choices like they did. The book is also beautifully illustrated. Peterson's drawings brought me to tears at times-- I particularly loved the Mary Magdalene and Eve drawings. The Miriam story features an Egyptian-style border that's incredibly beautiful. Peterson's work is currently featured in the "Practicing Charity" exhibit at the Church History Museum, and the illustrations are a real asset to the book. I can envision myself using this book in family scripture study, for Family Home Evening lessons and for Sharing Time lessons. It would have appeal to non-LDS Christians too, since the source material is from the Bible. My third-grade daughter made off with it the night we got our copy, and read the whole thing from cover to cover before bedtime. It's a book our sons and our daughters should read, because all readers, regardless of gender will benefit from the stories of these women. As an added bonus, all proceeds from the book will benefit Interweave Solutions, a nonprofit dedicated to support educational and employment opportunities for LDS women around the world. (This review was originally published at Segullah). Tosh is a nerd at a San Francisco prep school by day, flying under the radar. But by night, he's the best young ninja in the city, trained by his father (who runs a karate studio as a front). Amy is a fellow student, both at the prep school and at the dojo, and Tosh's father invites her to train to become a ninja just as a serial killer starts killing people all around the city, leaving behind the unmistakable mark of the ninja poison Dragon Bile. As Tosh and Amy work to uncover who's behind the murders, they also discover that they have feelings for each other. 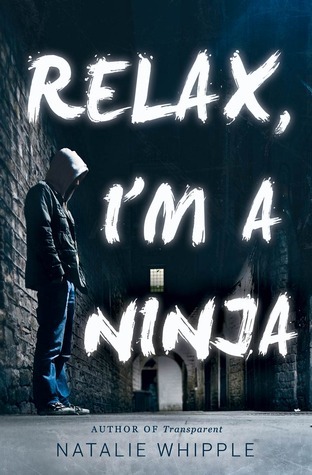 Relax, I'm a Ninja is a really fun read. It has just the right amount of action, well-drawn rounded characters in Tosh and Amy, a fun, smart mystery, and a little romance. In fact, the romance was one thing that made this book hard to classify. On the one hand, it's got the kind of action I think my teenage son would totally dig. I'd put it in the Hunger Games/Divergent- strong girl camp, except that the narrator is a guy. On the other hand, Tosh talks A LOT about what he's feeling about Amy, which made it feel a little girly (sorry, gross generalization, I know). And then theres the fact that about halfway through the novel, it shifts from our everyday world to a speculative world where ninjas can steal souls and have superpowers and stuff like that. I liked that surprise and thinks it works here, but that ordinarily would be a strike against the narrative for me. So I guess I'll give this book to both of my teenagers and suggest they read it. I think they'll both love it, for different reasons. And yes, there will be a sequel or two. It feels written to be a movie or three. It's been a few weeks since I finished All Joy and No Fun, and some of the details seem to be slipping through my mind. But Senior's premise remains clear-- parenting is a more complicated proposition than it used to be. A hundred years ago, children worked for us. Fifty years ago, we ignored them as much as possible. Now parents are the servants to their children, and it makes parenting a much more fraught experience. 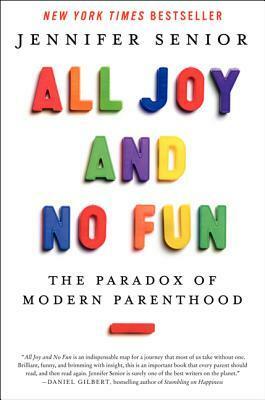 The format of Senior's book is interesting and effective-- in each of about six chapters, she follows individual families to highlight a different facet of parenthood (parents with babies and toddlers, parents with school-age kids, parents of adolescents, grandparents functioning as parents). One thing that was interesting to me, personally, is that the book was inspired by the ECFE classes I took with Bryce and Annie when we lived in Minnesota, where kids and parents gather for a two-hour class, they play collaboratively for a while, then the parents separate with a parent educator to talk about parenting issues. In fact, nearly all of the families she follows live either in Minnesota (where I got my parenting footing with Bryce, Annie and Isaac) or in Houston, Texas (where we lived when my kids started school). While the case studies were enjoyable to read and Senior did a good job analyzing those studies and bringing in support from other sources, I think that most parents will gain the most from looking at their own lives through the lens of the book. I often wonder why I, as a stay-at-home mom, constantly feel run ragged, why I find it so hard to motivate people to help me around the house, why I'm always in the car. And I've come to decide that it's because I have six kids like my grandmother did two generations ago, but I'm trying to raise them in the intensive parenting style that most people do today with far fewer children. Will that change things for me? Probably not, but it's nice to have a little bit of insight into my own mania. I'll be honest: I didn't like this book very much to begin with. The initial chapter, which is a letter from Hungarian photographer Gabor Tsenyi to his parents, thanking them for supporting him as he found his artistic footing in Paris. Gabor sounded childish and indulged and petulant, and I wasn't sure I wanted to continue with his story for another 440 pages or so. But I was out for a run, and I didn't want to stop to find another book on my phone, so I kept listening. I'm so glad I did. Lovers at the Chameleon Club is everything I love in a book. It's epic and detailed (which I know grates on some people), involves a historical setting-- Paris from the late 1920s through World War II (I just found out that the story was inspired by an actual photograph and some of the characters are loosely based on actual people), lots of narrative voices, unreliable narrators, and a rich, complex, sympathetically unsympathetic female protagonist in Lou Villars. From the time Lou is a small child, she's different from other girls. She wants to dress like a boy, and her parents eventually send her to a convent school because they find it difficult to be around her. From there she becomes preyed upon, both by other students and by the quack doctor who trains her for the Olympics and gets her to run off and join him in her feats of athletic prowess. 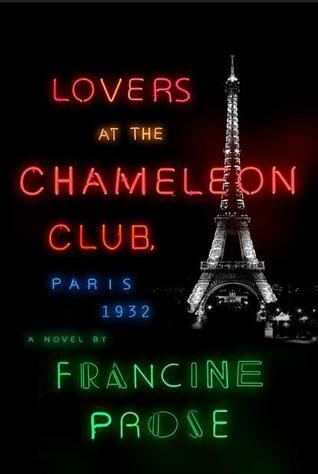 From there she lands in Paris, where she works in a gay/lesbian nightclub, The Chameleon Club. Eventually, her story joins Gabor's story, when he takes her photo and it makes him famous and her infamous. Later, her star burns brightly when she becomes a racecar driver, but she later finds her calling in a more sinister purpose. The book is lovely, because I am the kind of reader who loves losing herself in what others might consider too many details or too many perspectives of the same events. I loved Lou's character, and what writing her biography did to the woman who chose her as a subject (although the last chapter was a little strange in that regard). It's definitely an adult book, and one that gives readers an insight not only into the glittery, Josephine Baker Paris of the late 1920s and the early 1930s, but also how everyday Parisians lived during World War II.